Natural Relief for Anxiety and Stress: A Practical Guide is a nonfiction self-help health and wellness book written by Gustavo Kinrys, M.D. and Alexandra Gold, M.A. Anxiety and stress seem to be an integral part of living in modern society, but the fact remains that these disorders can have serious and lasting effects upon one’s emotional and physical well-being. And while there are pharmacological remedies that can be prescribed by one’s physician or obtained over the counter, those medicines often have side effects or can be habit forming. The authors discuss the causes and effects of stress and anxiety; describe the symptoms often signalling those conditions; and offer ways to alleviate the problems experienced. They also introduce Cognitive Behavioral Therapy or CBT as an effective and natural way to come to terms with those things which bring on stress responses and to effect lasting change. There is a chapter which includes nutrition-based remedies such as inositol, l-lysine and l-arginine as well as one which delves into herbs and flowers and the ways stress and anxiety can be treated with those natural remedies. Natural Relief for Anxiety and Stress is a well-written and comprehensive guide that is suitable for both the novice and the more experienced student of natural remedies. I’ve read a number of books on the subjects of herbs, CBT and relaxation techniques, and was quite impressed with the breadth and depth of the topics the authors covered while maintaining a format that is easy to read and understand. I especially appreciated their discussions on nutrients, herbs and relaxation techniques as well as their chapter on stress and anger management. I especially liked what I found in the Appendix where the authors present tables summarizing many of the remedies they discuss in the book, a shopping guide and an extensive list of recommended readings. Natural Relief for Anxiety and Stress: A Practical Guide is most highly recommended. Natural Relief for Anxiety and Stress: A Practical Guide by Gustavo Kinrys, M.D. and Alexandra Gold, M.A. is just that - a practical guide. The definition of stress and anxiety and the body’s reactions provide great insight into possible reactions the body has. A very detailed listing and description of natural remedies, with both possible positive and negative effects on the body, provides the reader with a variety of choices for supplements that could be effective. Resources not normally considered as remedies are also shared. I found Natural Relief for Anxiety and Stress to be a timely read for me. Since coming off medicine for chronic fatigue, I was searching for something besides another pill to combat the withdrawal effects. In discussion with my doctor, she had mentioned some of the suggestions included in Natural Relief. Reading Natural Relief was just what I needed to motivate me to try some of the ideas. Not only does Natural Relief contain a list of nutrient-based ideas, it contains others that I had not even considered. I took copious notes as I read. Of great importance to people suffering with stress and anxiety are Kinrys and Gold’s suggestions for dealing with the issues. The concise tables of information included at the end provide a great way to review the information to help the reader make the right decision. I loved the addition of a grocery shopping list. I plan to keep it handy as a reference as I journey off the pharmaceutical path. I highly recommend Natural Relief for Anxiety and Stress to everyone for a more enjoyable way to handle life. In Natural Relief For Anxiety And Stress: A Practical Guide by Gustavo Kinrys MD and Alexandra Gold MA, the authors go through many of the alternative ways of treating issues that affect people these days. They highlight both the pros and cons of different ways to deal with the issues that drag certain people down and keep them from living a full life. The book is practical and presented in a way that makes the information easy to absorb and refer to. In the beginning of my own journey through anxiety and stress, I would have loved a book like Natural Relief for Anxiety and Stress. There is so much information out there offering solutions, but the authors give fairly detailed and accessible descriptions about many of the treatments a person might be drawn to. I particularly appreciated the tables and the grocery list in the back. Many of the suggestions are practical, affordable (even free), and easy to slip in when you need them. Although stress and anxiety can cause a person to shut down and fall into a downward spiral, having a resource like this to refer to and practice can provide a natural safety net to instinctively turn to. Natural Relief For Anxiety And Stress offers options other than or in conjunction with the medications available. I also appreciate the reminder that all alternative treatments are most effective and safe when taken under proper medical care. As a person working through anxiety and stress issues, I highly recommend this book to anyone facing the same issues. Though not all of the suggestions may work for you, there are many options to work with in actively seeking to create a better life. Natural Relief for Anxiety and Stress: A Practical Guide by Gustavo Kinrys MD and Alexandra Gold MA offers helpful information and advice on how to deal with anxiety and stress. As someone who suffers from anxiety myself, I found this a helpful book. I like how the authors explain what is happening to your body during an anxiety attack. I learned something similar in therapy and sometimes simply explaining what is happening to you can have a calming effect. When you experience an attack, it can be very frightening, but knowing why your body is responding the way it is, and what your body is doing, can be very helpful. People may also have different triggers which could set them off. Diet can be an important part of getting anxiety under control. The authors have included ways of relieving anxiety outside medication. I think this is very helpful as some people may not want to use medication or may want something to go alongside it. This is an interesting read and I think it would do well on the market. I also think it would do well for the family members of a person who suffers from anxiety as they may have a hard time explaining what they are going through. This book can offer them tips on how to calm the person down or at least to be more understanding of what they are going through. An insightful and detailed book with plenty of helpful information. I would recommend it. Stress and anxiety are part of everyday life. Natural Relief for Anxiety and Stress: A Practical Guide by Gustavo Kinrys MD and Alexandra Gold MA speaks about the harm caused by anxiety and stress and how ignoring it can lead to worsening conditions. This handy guide helps readers to learn about the natural and alternative options that are available for relieving anxiety and stress. The information is supported by medical research for individuals who prefer to try a natural solution prior to pursuing medication. 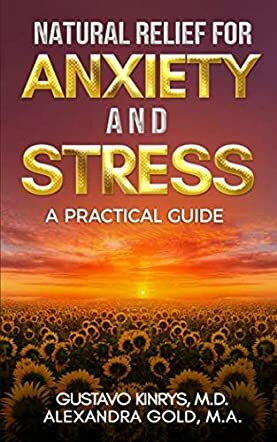 Reading this book will make you aware of what stress and anxiety are exactly, and gives information on what natural tools and remedies are helpful to ease the body and mind during stressful situations. These natural remedies do not have harmful side effects like medication and can be used without any fear. The authors' approach to a relevant topic is extensive and they have handled it methodically, making it easy for readers to apply the advice if necessary. The symptoms of anxiety and fear listed in this book are helpful to readers to check what exactly their problems are. The book lists the types of food that can be consumed to reduce anxiety and stress levels in the body. The tables listing the nutritional, herbal, natural, and alternative remedies are very useful and this book will leave all those readers struggling with stress and anxiety with optimism, hope, and relief. Natural Relief for Anxiety and Stress is very well written; it is very clear and can be easily understood by all readers. It is a good book for therapists and counselors to have because it will help them deal with their patients in a beneficial way.